Yeah, but: If only they'd done this before. 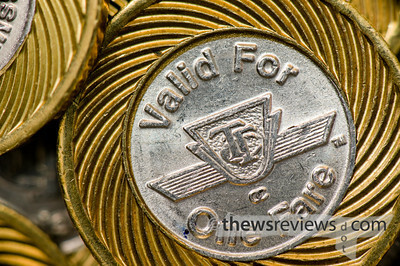 The Long Version: TTC tokens are great little things. Unlike the paper tickets that the Toronto Transit Commission phased out in 2008 (for adult fares), they don't get ruined if the go through the wash, they work in the automatic turnstiles that the TTC uses in all of its entrances, and they're more difficult to counterfeit - notwithstanding that the new bimetal design was introduced to get rid of five million fakes of the old aluminum design. 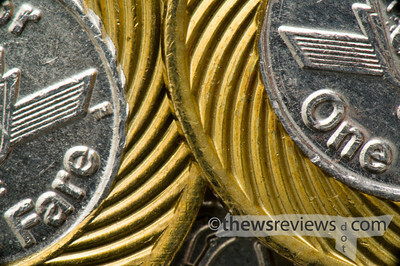 A TTC token has no face value - they're worth one ride, no matter how much that costs. The 2010 fare increase makes them the safest investment in town; their value is guaranteed to jump from $50 to $55 per troy ounce. According to information from the TTC, reprinted by the Globe and Mail newspaper: "Although there are about three million tokens in circulation, staff rely on about 400,000 tokens being recycled throughout the day in order to keep from running out." That means that there's only a seven or eight day supply in the system, and now people have a good reason to hang on to them. What could possibly go wrong? The twenty-five cent fare increase was announced two months before it comes into effect, so it's no surprise that the TTC has had a surge in demand. They quickly - but not immediately - rationed token sales before eventually stopping them completely, which is the same thing they did the last time they increased the transit fares. But the TTC also has a corporate culture that emphasizes blaming their customers when things go wrong, which includes people actually using the transit system. The Toronto Star recently published an article "Hoarders Foiled as TTC Halts Token Sales" which is one of many articles that contains my favourite quote of the week: "TTC chair Adam Giambrone said the commission could have lost $5 million had it not suspended token sales." 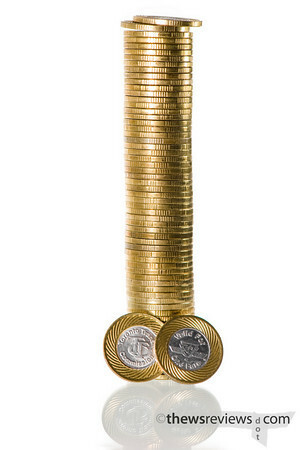 To have their customers stockpiling tokens cost them five million dollars of lost revenue, then we would need to be holding on to every single token ever minted and have the fare increase by $1.67. Even the earlier unspecified loss of 'millions' in unearned revenue from customers buying their fares at a lower rate is implausible when the fare is only increasing by twenty-five cents. One million tokens, a third of the total in circulation, will increase in value by only $250,000 unless there's something seriously wrong with my math. But token hoarding works both ways. The TTC is spending $50,000 to print temporary paper tickets that will only be valid for two months, and they'll need to be topped up by adding an extra 25¢ to the farebox each time they're used in January. 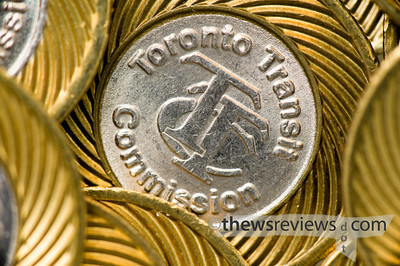 The TTC won't be selling any more tokens until the fare increase comes into effect, which means that the TTC will also be hoarding tokens to its financial advantage. They'll make back the $50,000 investment - twenty-five cents at a time - by not selling a mere 200,000 tokens until after the price increase. By their own numbers, that's an average half-day's volume, and only one-fifteenth of the three million tokens in circulation. A twenty percent increase on four hundred thousand is sales of an extra eighty thousand tokens a day, and at 25 cents each that's a potential loss of $20,000 - not quite half of the amount that the blame-the-riders movement is trying for. But even if the claim that the TTC makes of $45,000 a day is true, it's still less than half of what they'd need to reach their claimed loss of $5 million, even assuming that their losses started the day the fare increase was first proposed. And just for fun, let's remember that these costs are potential revenue that they won't get from the fare increase, which is valued at some $65 million dollars over the course of the year, and most of which will come from more expensive transit passes. The TTC is using implausible numbers to villainize a huge number of its own customers, in what seems like a calculated effort to make themselves look like victims when people don't want to pay 10% more for the same intermittent-to-lousy service. This is nothing new, but it controls the discussion and intentionally directs it away from talk about how the system - transit and funding - is broken, and what can be done to fix it. Costs go up; the day-to-day and year-to-year fumbling of the status quo remains unchanged. There's no question that the TTC is underfunded. There's also no question that the senior management hates its riders. Could those two things be related? Interesting that Canada Post decided a few years ago, with their new "P" permanent stamp, that hoarding was not likely to be a problem...and that having consumers invest in the system up-front (ie by buying more stamps, knowing they'll never expire) was probably to the company's benefit in the long run. Great site! 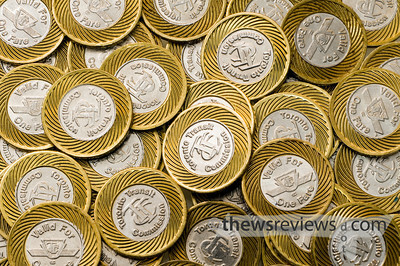 One of the things that I learned in my reading is that the TTC had 24 million of the old lightweight tokens - presumably only counting the legal ones, not the abundant counterfeits. They only went with a small run of the new design because they're going to be switching to electronic 'smart cards' Real Soon Now™. The day-to-day fumbling will continue for a very long time.